Today we launched our Desert Horizon Collection with our partner, BBJ Linen. Summer, the season of celebration and entertaining, is right around the corner – and what better way to make unforgettable memories this summer than a fiesta? Inspired by our new Desert Horizon collection, we looked to incorporate the bold colors and its rugged beauty the region is known for in our partyscape. Southwestern patterns are very much in style right now. These native patterns, in an updated palette, are modern and super chic. To elevate your summer soirée beyond just another BBQ by the pool, follow these tips on how to make your get-together a southwestern inspired affair. 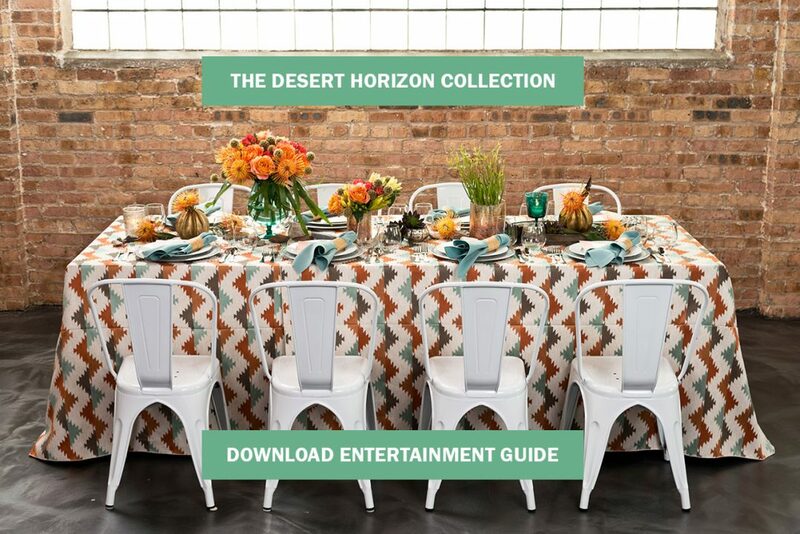 Our Entertaining Guide introduces our 9 brand new patterns and textures from the Desert Horizon collection! Download the guide to discover these exciting new designs and receive tips for entertaining.